Ok, sometimes it IS the destination! Whoever said “It’s not the destination, it’s the journey” never rode a Sportster on a four-lane highway in 30 mph cross-winds. It sure seemed like a beautiful day when we were standing in the driveway… there really didn’t seem to be any wind, the temperature was around 70 with a clear blue sky. Our original plan was to collect Garry and Shirley in Carlisle and then make a loop to the southeast and then back up to Newton and home on old highway 6. When we got to Carlisle with Howard and Brenda, Garry & Shirley suggested that we go a little farther on to Pella, where the annual Tulip Festival had just concluded. Since I’m not as familiar with that area, we had Garry take the lead to get us there. In all we rode a hundred miles – and I am FINALLY sporting that “sun-burned from the forehead, down” look you get from wearing a do-rag and sunglasses! You’re too funny! I can just see you gripping that zipper pull with all your might! Sorry..don’t have a solution for “your problem” but have experienced it myself and it is definitely annoying! Glad you enjoyed the Tulip Festival! Sounds like a good ride, but I know what you mean about jackets ballooning. Mine does the same out on the freeway. Riding in crosswinds is the worst! At least you had a lovely destination. I went looking for tulips recently also; see my blog. Your description of riding with a do-rag makes me envious. I would LOVE to ride without a helmet someday. Doesn’t the wind hurt your ears? I wear ear plugs to save my hearing when I ride far and fast. I enjoyed your post. OMG, I hate riding in strong winds. My little 883 Hugger gets whipped around like crazy! It is completely exhausting. My hubby riding behind me can even tell how tough i am struggling and says he can see me blowing across the lane. 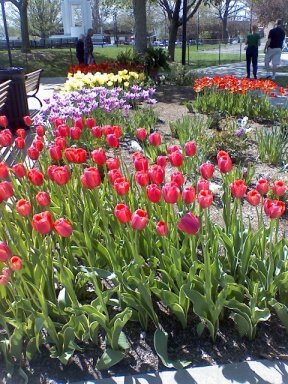 Great Pictures…Pella is always beautiful during tulip time. I had to laugh about you and the zipper and Garry and the antenna. I think the worst thing though is the wipping of the antenna…I finally had to have Dan fix his because it would get to wipping and would wack me in the head. Not a pleasant feeling for an entire trip. I really like your website and think you offer some great resources to your visitors. 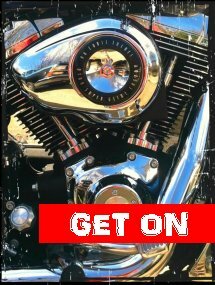 I wanted to point you in the direction of uShip’s motorcycle transport page at http://www.uship.com/motorcycles, which I think would be another great resource for your website. Our motorcycle transport page has a ton of hints and tips and will surely make that process smoother for your visitors. Additionally, our transport marketplace can save your website visitors up to 80% when compared to traditional motorcycle transport. I really think you’ll agree that your website visitors would benefit from this resource. Thank you for your time. If you have any questions or comments I would love to hear them. 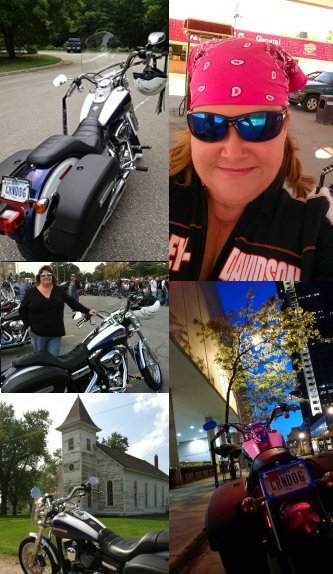 Hi Biker Chick….hope everything is ok with you since you haven’t posted in a while! Hi Stephanie, yes all is well, I’ve really needed to get caught up here – I have THREE rides to post about that I haven’t done yet… we are watching flood waters closely as we are two blocks from the levee and river, plus my dad passed away this week so I am working on photo boards for the funeral. It’s a sad/nervous week. THanks for checking in, I will post soon. Janets last blog post..Ok, sometimes it IS the destination!